To understand ourselves and our true nature to understand our true identity in Christ. 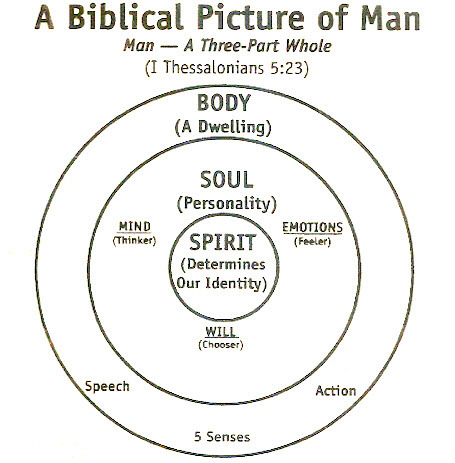 Man has three parts–body, soul and spirit. The body relates to the natural, external world. The body is where we live. It includes the five senses: taste, feel, sound, touch and smell. Bill Gilliam calls it our “Earth Suit.” It’s the epidermis, or skin, that keeps everything inside from falling out. It also can help keep bad things from coming in. The body insulates us from both heat and cold. It is called our “flesh”. Besides insulating us, our flesh consumes food, air and water. It also allows our senses to perceive things that look, taste, feel, smell or sound good or things that aren’t so good. The body responds to stimuli from external sources. Our thinker, feeler and chooser work together to show the outside world our personality. Stimuli outside the body encounter the skin and senses and send impulses to the brain. The brain makes a couple hundred decisions a second to decide how it will respond to the stimuli. Our brains identify the stimulus, determine whether it is good or bad, and then sends signals to the right parts of the body to either accept it, reject it, respond emotionally or fight to rid itself of the intruder. In addition to a “THINKER”, Dr. Gillham says we also have a “FEELER”, representing our emotions. For instance, let’s say John breaks up with Jane and starts dating Jane’s best friend, Marsha. John sends Jane a text in the middle of math class notifying Jane of the news. Jane sees the words on her cell. The eyes send stimuli to her brain. Her brain processes the impulses then sends signals to Jane’s face and mouth and eyes and commands them to smile (her body’s response to the stimuli). Jane wanted to break up with John anyway. If Jane had liked John the brain could have sent impulses to her eyes and her lungs and her face muscles with the command to cry. In addition to the mind and the heart the soul is home to our will. Our will is responsible for every decision we make. Outside influences can sway our will, by our mind, by Satan, by other people and by our emotions. We make snap decisions, wrong decisions, wise decisions, deliberate decisions, cautious decisions, inappropriate decisions, lustful decisions, et. al. One of the decisions we can make is to decide who will be making decisions. We can make decisions in our flesh, depending on our own resources. Or we can surrender our wills to God and wait on Him to guide us into the decisions He makes. God’s decisions will always be the best ones for us. The Holy Spirit is the third person of the Trinity. Our spirit is the third part of man’s nature. Our spirit is the part of us that relates to God. In Christ — As spirit beings, once we accept Christ as Lord and Savior we are in Him, our spirit is alive in Christ. 1 John 4:13 tells us, “This is how we know that we live in him and he in us: He has given us of his Spirit. ¹Lifetime Guarantee, by Bill Gillham; © 1987, published by Wolgemuth & Hyatt, Brentwood, Tennessee; pg. 57. The Grace Life Conference Handbook, © 1993-2000 by the Association of Exchanged Life Ministries, www.aelm.org, was an inspiration for this post. This entry was posted in Biblical Principals, Exchanged Life, God, God's Will, God's Word, Grace, Grace / Mercy, Identity In Christ, Jesus, Life, Love, The Gospel, The Holy Spirit, Truth and tagged body, Exchanged Life, Holy Spirit, Jesus, man's nature, nature, our true self. 1 Thessalonians, soul, spirit by Steven Sawyer. Bookmark the permalink. My father told seeing a man and three white dots. I found your website. Read an article. My father is on his journey to God. Last days on morphine, but these days with God. He also told about four animals, one of them is turtle,. Thanks for your article. Its really comprehensive explanation . You can reach me on email if more details needed. Thanks, Marshall. I appreciate the reblog. I also like browsing around your blog. Good stuff. Actually 1 Thessalonians 5:23 along with a host of other God breathed verses (Heb 4:12, Prov 20:27, John 3:6, etc.) affirms the distinction between man’s soul and his human spirit. Of course, as mentioned above in John 4:24, the Lord Jesus affirmed one of the functions of our spirit, which is to worship and have fellowship with God. Additionally, our regenerated spirit qualities us to be sons of God as affirmed in Romans 8! Thanks, Mark. I appreciate your insight and comments always. God bless. The extended view of the soul is very helpful; I have never seen it explained in quite the same way. I’m sure scripture would bear this out, but I don’t have the time right now to do the research! Thank you for your comment. If I get some extra time in the next days, I may be able to share some Scripture that will help you with this. Hebrews 4:12 is usually considered a good reference: 12 For the word of God is alive and active. Sharper than any double-edged sword, it penetrates even to dividing soul and spirit, joints and marrow; it judges the thoughts and attitudes of the heart. This verse tells us that the two, soul and spirit, are two distinct parts of us.